While we prepare and ponder adopting some new furry friends of our own, we visited one of our favorite sanctuaries over the weekend. Valley of the Kings is a non-profit big-cat rescue located in southeastern Wisconsin, near the towns of Darien and Sharon, close to the Illinois border and only a short drive from Delavan and Lake Geneva. Valley of the Kings rescues big cats that were seized or surrendered by people who had them as pets, in illegal roadside zoos, or as guard animals — a favorite among drug dealers, apparently. They’ve also been known to take in other exotics, including tortoises, bears, llamas, camels, and wolf-dog hybrids. Wolf-dog hybrids are remarkably dangerous animals. Our tour guide, Angel, tells us that they look like dogs, but are wild and unpredictable. People sometimes intentionally try to get such a crossbred animals, only to regret it when the pups reach maturity and become difficult to control at best. The main attraction at VotK is the big cats. They have a number of lions and tigers, and have also rescued Ligers, ill-advised lion-tiger cross breeds that grow huge but generally suffer from a number of health issues. One of Angel’s favorite cats is Leena, a female tiger who often comes when Angel calls her. Today Lena was feeling aloof, and initially rebuffed Angel by turning her back and walking away. She didn’t hold out long, however and sauntered over, chuffing and flopping down right near the fence. She posed beautifully for me, but only for a moment, so I was lucky to get this photo. Chuffing is a tiger greeting. It’s a loud, breathy purr, and experienced big-cat keepers know that when a tiger chuffs to you, it means they’re in a good mood. If a tiger doesn’t chuff a greeting when you approach, best to steer clear. Tracy’s recent favorite addition to the menagerie are the bears. VotK has several grizzly bears, and watching them eat brings a smile to her face. We brought a couple bags of pecans for the bears as a treat; we learned last time that pecans were just about their favorite thing in the world, so we were happy to oblige them with treats for later. Valley of the Kings is not a zoo. To be able to tour the facilities during scheduled public hours, you have to buy a membership in advance, either with a check by mail or through PayPal. Membership fees help keep this very expensive operation running — big cats require a lot of meat! We’ve enjoyed supporting Valley of the Kings for several years now, not only with our membership funds, but also with donations we bring on our annual visits, like paper plates and paper towels, frozen chicken legs, and old blankets. 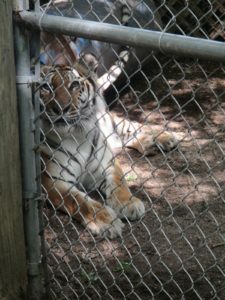 They have an extensive wish list of consumable goods they need daily, as well as heavier equipment they require to maintain the sanctuary, and to build — and rebuild — enclosures for the animals. Valley of the Kings publishes a beautiful wall calendar every year, and on our visit we were able to buy the 2019 edition. We’re still working our way through the 2018 version, but it’s nice to have next year’s already in hand. Valley of the Kings is a wonderful sanctuary for animals. It’s unfortunate that so many people are able to acquire these breathtaking animals as pets, but it’s good to know there is a place they can go to live out their lives in relative peace and plenty. We support Valley of the Kings, and hope you will too. Beautiful piece Bill! Everything is spot on, except for it sounds like you thought I said the volunteers went into the enclosures with the hybrid wolves. I must have been misunderstood. Our volunteers never go in with the hybrid wolves, or lions, or tigers. The only thing I can recall talking about is when the gardener is watering the flowers, Lena may stalk her when she turns her back on her. I need to make it clear, we do NOT go in with the exotic animals. You are an absolute wonderful writer. I loved reading this, and was shocked to see my name. lol. My mistake, Angel. I’ve edited the piece to remove the erroneous passage. Thanks for reading – glad you enjoyed it! Thanks also for the great tours we’ve had with you these last two years.